The page is the gateway to freebies for particular figures (the popular definition of "characters", as opposed to the technical definition of "characters"), whether the figure is free or not. If you do not find what you are looking for on this page, please try the complete list of Figures. This list follows the technical definition of "figure", so it contains not only characters but also other rigged objects such as vehicles, some rigged props and such. That Figure list is much larger then the lists on this page. Note to Contributors: Please add links to the individual pages, not to this page. Figures that we want pages for, but do not yet have, are listed without links (or with links to the download pages for the figures) - but that doesn't mean we don't want pages for other figures! If you have a list for a figure that isn't listed here, please create the page and make a link to the new page from here or select a category from the types identified here so that the figure will be accessed with the appropriate classification. For a more complete list of all of the creators, see the Creator category. Note that only a very few creators make figures. fully poseable .fbx character with textures. 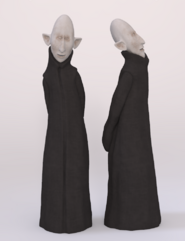 Fully poseable character in .fbx format rigged in mixamo with corresponding textures. This is MakeHuman v1.1.0 in default A-Pose rigged for Daz Studio. Man with riotsquad-type armor, with helmet. and 18-inch baton in sheath on right thigh. Poser model. DazStudio. Monster Maker There a 7 monsters and three people. Various expressions and head shaping morhps. Severel textures. And a few eyes. Its pretty much "Hito" from earlier. But better weight maps. You can still load any MakeHuman characters as morphs. Please read the readme for this. MakeHuman license. This original figure that looks like a Aiko3 body. This data is made by shukky. DazStudio. Stand alone witch. No clothes yet. Made with Hito, with a few improvments. Stuffed bag with grass. Cool Suitable for versions from Poser 7 and up. And many, many more scattered across the web. These figures are derived from other figures. Somebody took the original geometry, modified it, re-rigged it and encoded the new geometry against the original, with RTEncoder or Objaction Mover. A Posette based figure. It's RTE encoded against the original Posette obj, and uses Victoria 1-2 textures. It comes with a lot of morphs, a few textures and clothes items. A newer version of Nea, and as the orginal, based on Posette. It's RTE encoded against the original Posette obj, and uses Victoria 1-2 textures. It comes with a lot of morphs, a few textures and clothes items. It can use original Posette clothes (with a morph). Zenon is an attempt to do for Dork what NEA did for Posette. It has completely new head (based on Posette), a lot of morphs and uses Michael 1-2 textures. http://www.planit3d.com/source/poser/narcissus1.html (the page has non-functional links to an earlier version of NEA). A subset of the No Longer Available resources. With the closing of RuntimeDNA as a separate store, these might or might not eventually be available elsewhere... but not just yet. This page was last edited on 21 April 2019, at 16:05.